Once while shopping with me at our local Chinatown, a glistening pile of bitter melons attracted my husband's attention. "We must get some of these great-looking bitter melons!" he exclaimed. As I was busy looking over other produce, I suggested that he pick a few from the pile. An Asian woman overheard us and noticing that Michael was Caucasian, she asked with amazement, "He likes bitter melon?" "He loves bitter melon," I replied. Chuckling with great pleasure, she remarked, "You have him well trained!" Bitter melon is perhaps the most bitter of vegetables. 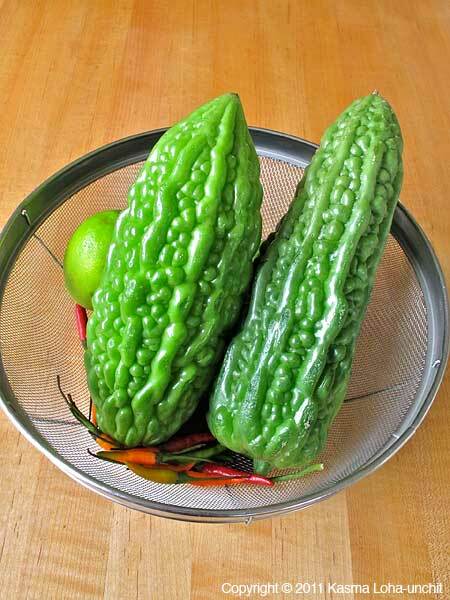 A member of the squash family native to southern China, it is medium to light green in color, oblong and averaging 8 inches, tapering to a point. Easily recognized by its shiny, fleshy and peculiar warty-looking surface, irregular ridges and bumps run the length of the fruit. A mainstay of local oriental produce markets, especially during the warm summer months, bitter melon is a common vegetable consumed by millions around the world – not only in the Far East, but also in many Central and South American and Caribbean countries. In the western hemisphere, it seems to be better known as an annual ornamental vine than as a food, with lovely, deeply cut leaves and bearing pretty fruits called balsam pears that ripen to a dramatic orangy red. Its bitterness comes from the high concentration of quinine it contains, which incidentally, is the reason why it is regarded by Asians, as well as Panamanians and Colombians, as a valuable drug for preventing and treating malaria. 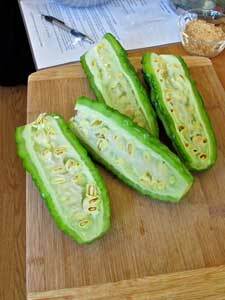 The vast majority of Americans who have tried bitter melon probably found the experience quite unpleasant, not something they would ever want to repeat. But really, bitter melon is a delicious vegetable – when cooked right and when latent taste buds on the tongue are given the chance to become acquainted with the most misunderstood and maligned of the five primary flavors. Moreover, it is immensely nutritious. Rich in iron, bitter melon has twice the beta carotene of broccoli, twice the calcium of spinach, twice the potassium of bananas, and contains vitamins C and B 1 to 3, phosphorus and good dietary fiber. It is believed to be good for the liver and has been proven by western scientists to contain insulin, act as an anti-tumor agent, and inhibit HIV-1 infection. Though indisputably good bitter medicine, Asians like bitter melon because they are fond of the taste. In the Orient, a healthy well-balanced diet includes the bitter taste, supplied by bitter greens, fruits, herbs and roots. Like the spicy flavor, which increasing numbers of Americans are growing to love, the bitter flavor may initially take some getting used to, but can become addictive once a taste for it is acquired. It would be prudent for a beginner to ease into it, starting with a mild bitter and gradually working up to higher concentrations. Like chillies, which impart more than just hotness but their particular flavors as well, bitter melon tastes more than just bitter. And just as chillies vary in degrees of heat, bitter melons are not uniformly bitter. Younger, less mature fruits are generally more bitter. Riper melons that are milder in bitterness are lighter green in color with tinges of yellow on the outside. Inside, the spongy covering of the seeds would have turned from light greenish white to bright red. Over the years, in my Asian summer vegetables class, I have trained quite a number of normal Bay Area folk to love bitter melon. Very few of my students have found bitter melon objectionable; more than half actually like it enough to add the nutritious vegetable to their diet. In fact, many of them, like my husband, have developed such a taste for it that they crave it from time to time and rank it among their favorite Asian vegetables. Though commonly stuffed with pork or shrimp and steamed, or cooked with strongly flavored ingredients to neutralize the bitterness, I prefer to prepare bitter melon very simply in a quick and easy stir-fry – Bitter Melon and Egg (Mara Pad Kai). A light coating of eggs complement the melon's flavor beautifully. For an added kick, I frequently serve this dish with a table sauce of cut-up Thai chillies (bird peppers) swimming in good-quality fish sauce. I do not salt or parboil the bitter melon ahead of time as recommended by some chefs to reduce the bitterness, because such treatment can affect the texture and other flavors that it holds. Better to choose milder, riper melons to start out with until you graduate to full-flavored, deeper-green, immature ones – the only kind my husband would ever buy these days.